Posted: Wednesday, January 11, 2017. 3:26 pm CST. By BBN Staff: Along with the cost of fuel haven risen this month, Liquid Petroleum Gas/ Butane has also increased. According to a statement released from the Belize Bureau of Standards yesterday, the increase is effective today, Wednesday. The cost of butane in Belize is now $97 in Belize City, which is an increase of $15 per 100 pound cylinder. The new controlled price per 100lb cylinder of LPG by location is as follows: Belmopan $99, San Ignacio $99, Benque Viejo del Carmen $100, Orange Walk $98, Corozal $97, Dangriga $101, Punta Gorda $102. 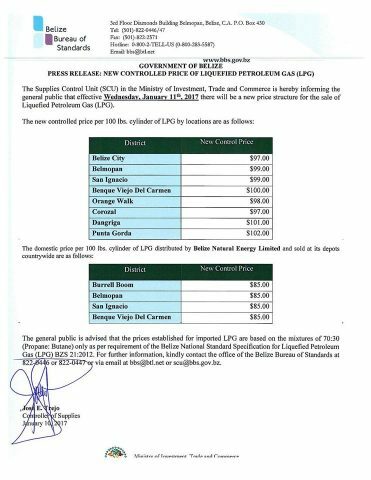 The domestic price per 100lbs LPG distributed by Belize Natural Energy and sold at its depots are as follows: Burrell Boom $85, Belmopan $85, San Ignacio $85, Benque Viejo del Carmen $85. In 2015 the cost of a hundred pound cylinder was $85. According to the bureau, there was a price control on LPG but that was removed after the company had been bought out by Central American providers. According to several popular food vendors in Belize City, there is consideration to readjust the cost of their food in light of the LPG increased costs.